German plane backs up into El Al passenger jet on tarmac at Ben Gurion Airport. Israel’s Ben Gurion International Airport was the scene of an aircraft collision Wednesday morning, when two planes backed into one another on the tarmac. The incident occurred when a Boeing 737 operated by Germania Airlines which had been scheduled to take off for Berlin backed out from the terminal to taxi out to the runway. 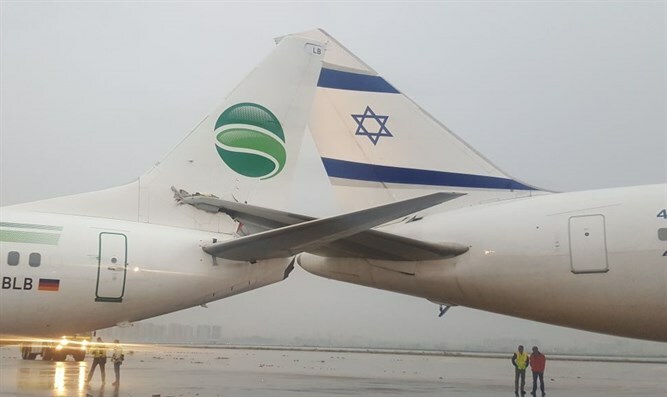 As the Germania plane was backing up, it collided with the tale of a Boeing 767 operated by Israel’s El Al airline and scheduled to fly to Rome. While no one was injured in the accident, all passengers from the two aircraft had to be evacuated. A spokesperson for Israel’s Airports Authority emphasized that passengers were never in danger during Wednesday’s collision. Authorities have opened an investigation into the incident. Last week, an Israel-bound flight from Budapest was forced to evacuate after smoke from a vehicle operating on the tarmac filled the cabin. During the incident, one Israeli woman was critically injured after she fell out from an emergency door before the escape slide had fully inflated.